At Scottsdale Pain and Wellness, we utilize both palpation guided and ultrasound guided injections. Palpation guided injections has been the method to administer regenerative joint injections for decades. Within the last few years ultrasound guided injections have been gaining in popularity as technology and practitioners skills have improved. Each of these injection methods have both advantages and disadvantages. Palpation is an art that involves examination with the hands, feeling for organs, masses or abnormalities of body parts. Musculoskeletal palpation is used to identify the location and abnormalities of different joints to perform palpation guided injections and has been the standard in regenerative joint injections for decades. Regenerative joint practitioners have successfully performed palpation guided regenerative joint injections such as prolotherapy, PRP, prolozone and stem cells. In addition to palpation skills, practitioners also utilize patient history and diagnostic tests such as x-rays and MRI findings. Most of the areas to be injected are painful on palpation and is a help to the practitioner when determining where to inject. Palpation guided injections require a strong understanding of the anatomy these injections have been provided with great success. The patient does not occur the cost of the ultrasound machine. Palpations guided injections have been successfully performed for decades. Dr. Arnold developed his palpation skills as a chiropractor with 16 years of experience and refined his skills as a naturopathic physician with 13 years of injection experience. Using the ultrasound for musculoskeletal conditions (MSK) has become increasingly more popular the past few years for both diagnosis and guided injections. Orthopedic Training organizations such as the American Association of Orthopedic Medicine, The Hackett-Hemwell Foundation and the American Osteopathic Association of Prolotherapy Regenerative Medicine Osteopathic now teach ultrasound guided injections as part of their training with regenerative joint injections. Some ultrasound training institutions now offer specific training in MSK and private companies with send experienced technicians to a doctor’s office to assist them with specific injection procedures. Diagnosis can be made of the underlying structures such as the tendons, ligaments and cartilage. Ultrasound guided injections may be reimbursable by some insurance companies. To the practitioner, there is an additional cost of the ultrasound machine that may range from approximately $30,00 -$50,000. There may be an additional cost to the treatment. Limited evaluation of intra-articular structures. Scottsdale Pain Rehabilitation and Wellness utilizes a state of the art ultrasound machine for superior imaging and needle visualization. This machine utilizes a broad frequency linear probes that offers both high sensitivity and deep penetration for scanning both superficial and deep joint structures. At Scottsdale Pain Rehabilitation and Wellness, both palpation and ultrasound guided injections are performed on a case by case basis. Palpation is always performed before any type of injection for proper needle placement. 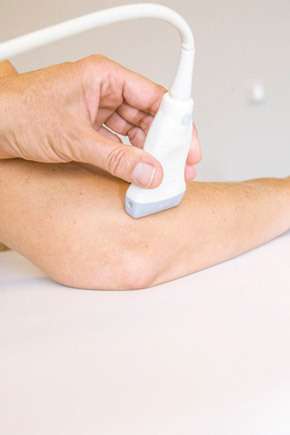 Ultrasound guided injections provide exact identification for the point of injection. Regardless, of which method used, regenerative joint injections have shown to be an effective alternative to other forms of musculoskeletal treatment such as physical therapy, steroid injections and surgery. The side effects of steroid injections should be reviewed before these injections are performed and surgery should be the last resort for any musculoskeletal procedure. 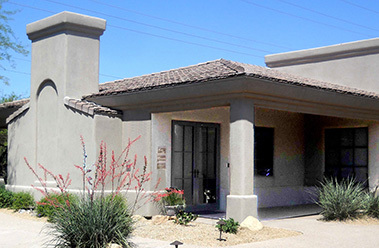 Please contact Scottsdale Pain Rehabilitation and Wellness if you have any questions how any of the treatment procedures performed at our office may help your individual condition.